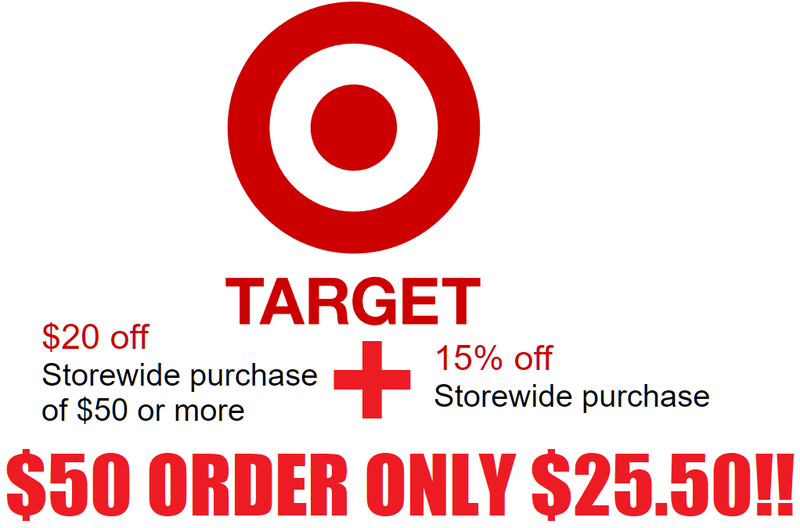 HOT STACKING TARGET COUPONS!! $20 OFF $50 + EXTRA 15% OFF + Free Shipping. If you do a $50 order it works out to 49% off!! $50 worth of items for $25.50. I used mine to get Bounty and Charmin. Also great deals on Tide and anything and everythign else you may need from Target. This is very rare from Target, grab it before it's gone!! Excludes alcohol, Apple products, Bose, CVS clinic & pharmacy, dairy milk, DSLR cameras & lenses, Elf on the Shelf, gift cards, Google products, GoPro, LEGO, mobile contracts, prepaid cards, Sonos, Target Optical, Tylenol pain relief, and Weber.